Why should you join the University of Bedfordshire’s (Hons) in Business Administration (Top-up)? Holders of BTEC HNDs (MAPS Associate’s Degrees) and Abe Level 6 Diplomas will only need to complete 5 (five) subjects in order to graduate with UoB’s BA (Hons) in Business Administration! Top-up Degree allows you to succeed faster and build upon previous qualifications! The University of Bedfordshire’s (Hons) in Business Administration (Top-up) course franchised by the University of Bedfordshire is a top up course for students who wish to attain a degree having already achieved two years of undergraduate equivalent study. The course aims to provide students with analysis and business research skills and develop their expertise in Marketing, Project Management and Operations techniques. The awareness of business and the knowledge base developed in this course will equip students for a broad range of careers in the world of business. The University of Bedfordshire’s (Hons) in Business Administration (Top-up) course also provides a solid foundation from which students can pursue postgraduate studies in a range of business management disciplines. Other qualifications may also be acceptable on a case-by-case basis. 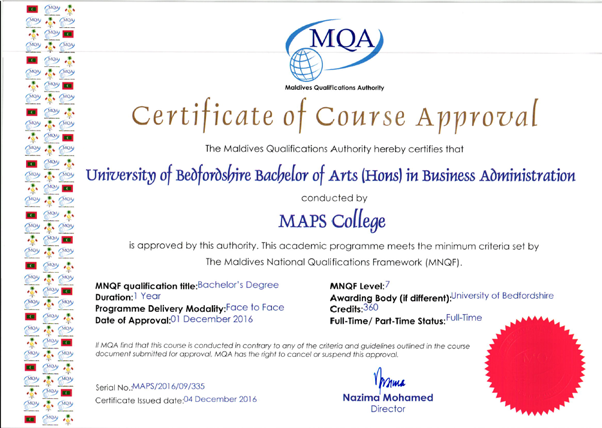 Students who complete the University of Bedfordshire’s (Hons) in Business Administration (Top-up) course may use it as a standalone professional qualification or progress on to a Master’s degree programme.